Today I'm going to reveal to you a powerful technical concept that is seldom taught in trading books. It is the concept of "A pattern within a pattern". Have you ever seen a Russian Doll? The Russian doll looks like any ordinary doll which you can use as an ornament in the house. The inside of the doll is hollow. But when you open the doll, you find another doll inside the first doll. Then when you open the second doll, you will find another smaller doll within the second doll. You can continue to find more tinier dolls usually up to 5 dolls including the original one. 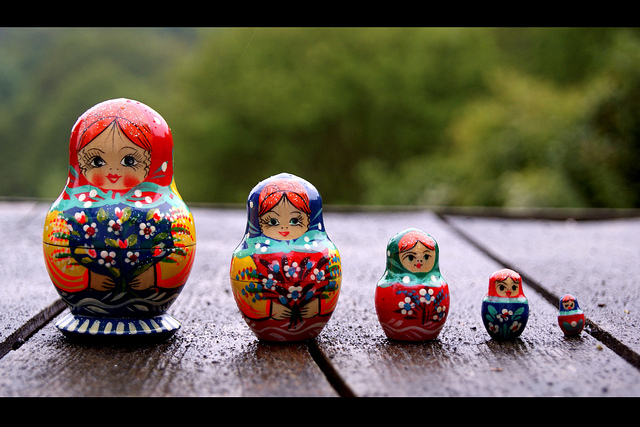 In the world of technical analysis we can often find our trading "Russian Dolls". A pattern within a pattern can often happen in stock charts. A pattern within a pattern is a very powerful technical concept that can send stocks exploding higher. When you have an ascending triangle within an ascending triangle, you have a reason to be doubly bullish. In order to illustrate this concept, I will use an example from BABA, billionaire Jack Ma's company. 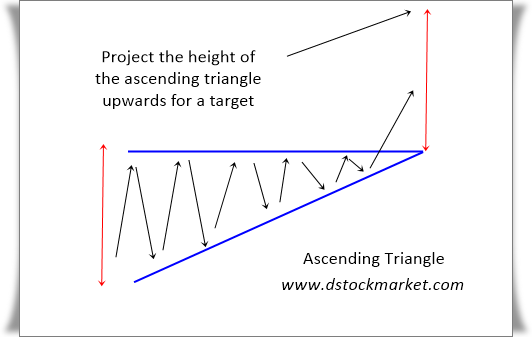 For those who do not know what is an ascending triangle pattern, this is what it looks like. Alibaba is one of those very hot tech stocks that is on the lips of many people. Of course, it is famous because it is one of the largest online buy and sell websites that made Jack Ma one of the richest man in China. Yesterday (at the time of this writing), Alibaba exploded higher by going up 4.49% in a single day. The technical catalyst for it is the stock was at the rising 20 day moving average. It also formed a bottoming tail the previous day. Furthermore, the stock was resting near the 50 MA and price support. Stocks tend to go higher when they are at these technical areas. I have written about them in this article How To Spot Day Trading Stocks That Explode Higher Immediately! When you see a stock that has a catalyst to go higher in the daily charts, you should zoom into the smaller time frame to find an entry. 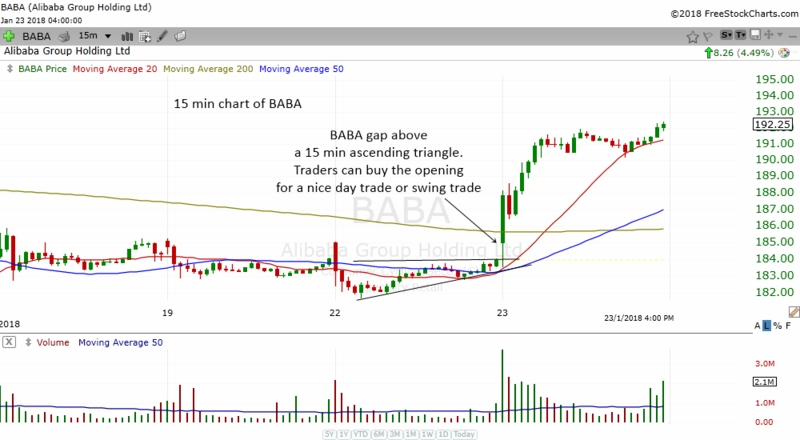 The chart above is the 15 min chart of BABA. As you can see, the 15 min chart formed an ascending triangle pattern. 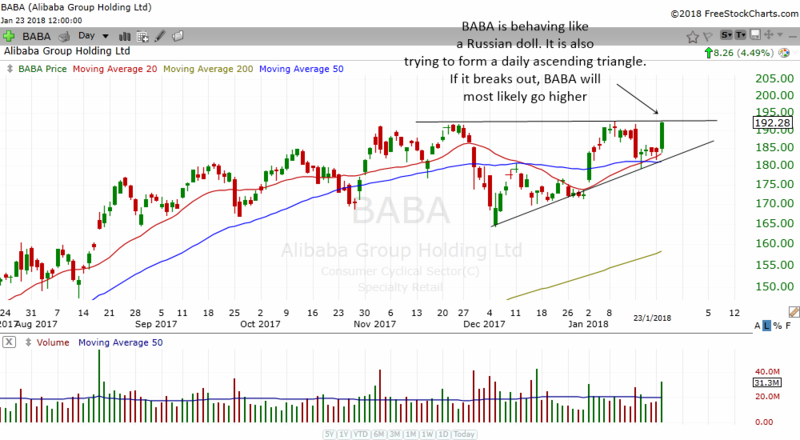 In the case of BABA, the ascending triangle acted as a bullish reversal pattern. The next day, the stock gap up above the pattern. 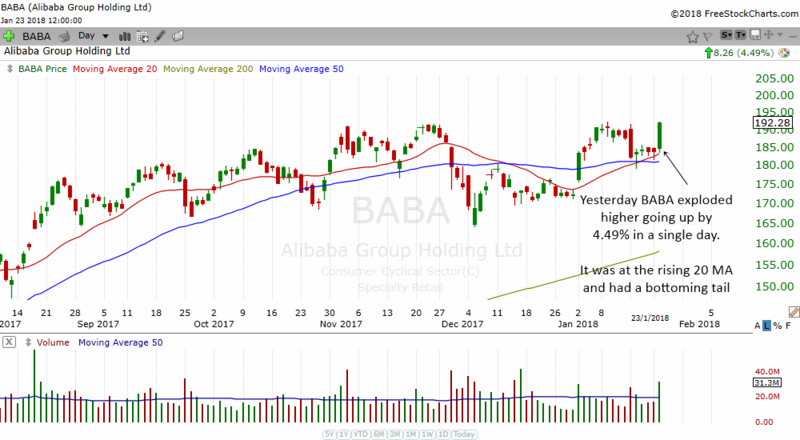 Traders can buy the stock for a nice day trade or even carry it forward to be a swing trade to capture more profits if BABA continues to go up. Some traders might sell 1/2 at the end of the day and keep another 1/2 to ride it higher. I entered BABA quite early when it was touching the daily 50 MA. I have already sold more than half of it and am still holding some of it. I also traded AABA which was formerly Yahoo. 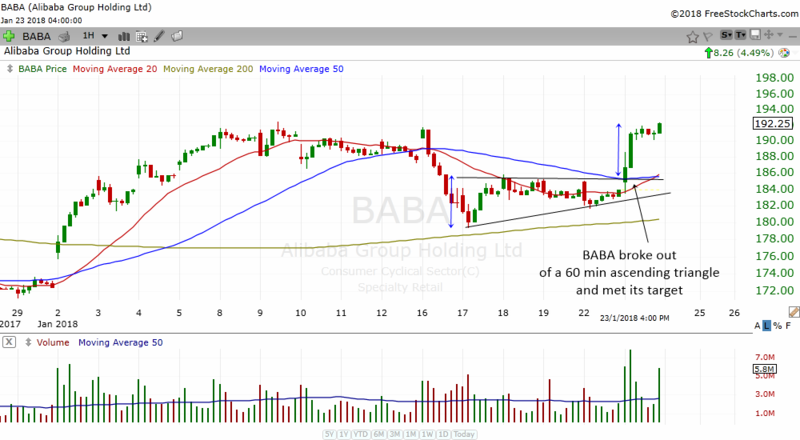 It mimics the movement of BABA but provides a cheaper alternative to trade the stock. Looking at the chart, BABA can definitely go higher the next day as long as it stays above the 190 area. Now, I'm going to show you something amazing! The chart above is the 60 min chart of BABA. What can be more powerful than the convergence of technical concepts? What you are witnessing now is the usage of multiple time frame analysis. Multiple time frame analysis can be confusing to newbies in the market but it is often used by seasoned traders to trade stocks. Below are 2 helpful articles I have written to explain the concept more in depth. Remember the Russian doll example I showed you above? There are many dolls within a doll. I believe BABA might be behaving like a Russian doll right now. For those of you who are observant, you may have already spotted it. The chart above is the daily chart of Alibaba. What I have done this time is draw an ascending triangle which you can clearly see now. If BABA breaks out of this pattern, it will most likely send the stock price higher and make Jack Ma richer! I hope this article has opened your eyes to the incredible potential of using technical analysis to spot trading opportunities. It takes practice and a sharp eye but when you master it, you will be able to do wonders in the stock market. Chart patterns can happen again and again in the stock market. Even a peculiar chart pattern like the ascending triangle within an ascending triangle can occur again and again. This time I noticed a 60 min ascending triangle within an ascending triangle in the 60 min chart of Nasdaq futures. The chart above shows the 60 min chart of the Nasdaq 100 Futures. As you can see, Nasdaq 100 formed an ascending triangle within an ascending triangle. If 1 ascending triangle was powerful, the presence of 2 ascending triangle is even more powerful to tell us that Nasdaq 100 wants to go higher. Notice how the smaller ascending triangle which I have colored black formed in the bigger 60 min ascending triangle which I colored blue. There were other hints that told observant traders to be bullish. The Nasdaq 100 had a bullish 60 min MA cross. Before the breakout happened, a bottoming tail appeared. This told us that the Nasdaq 100 rejected to go lower. So that is why it shot higher. 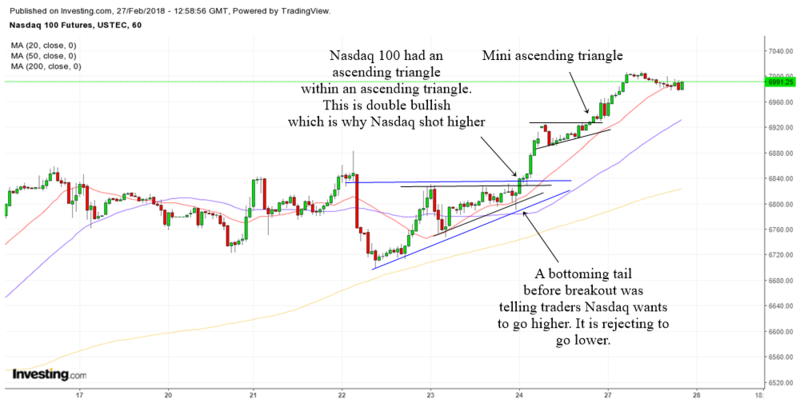 After the breakout, the Nasdaq 100 formed another ascending triangle. It is a mini 60 min ascending triangle. But if you look at the 15 min chart, it will be a nice 15 min ascending triangle. All this pointed to traders that the stock market wanted to go higher.